We’ve noticed that you enjoyed the giveaway we hosted together with TemplateMonster. 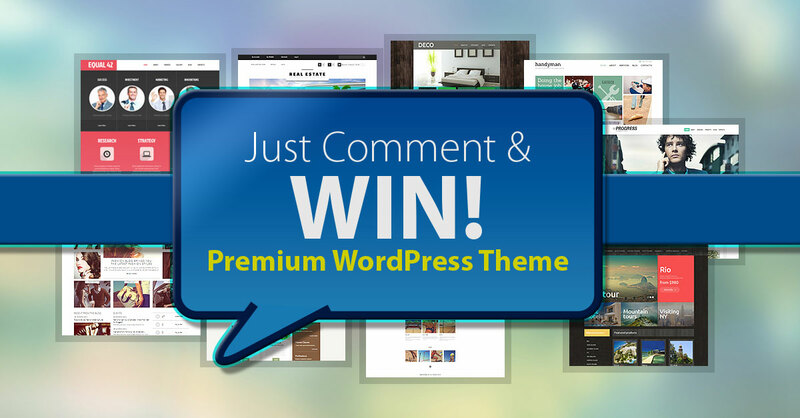 So, here is another chance for you to win a premium WordPress theme from a trusted theme provider. That’s it 🙂 Now you know how to get a stunning design for your WordPress site no matter if it’s a personal blog, a business site, a news site, a portfolio site or any other type of site. As we’ve already mentioned, prizes will be offered by TemplateMonster. Now, let us remind you of this company. TM is a US-based web design company which specializes in WordPress themes and other types of website templates (HTML5 templates, Joomla templates, Magento themes, PrestaShop themes, etc). The TemplateMonster team have built more than 40,000 templates since 2002, when the company was actually founded. The best thing is that there are over 2,000 WordPress themes at TemplateMonster and you can win any of them. But please, don’t be confused by the choice of WP themes available. Even if there are so many WordPress themes at TM, it will not take you long to find the perfect theme for your WordPress website. Why? First of all, you can search themes by category (Art & Photography, Business, Hosting, Fashion, Real Estate, Travel, etc). Then you can narrow your search to responsive WordPress themes. You can also search themes by style or keyword. Finally, you can filter themes depending on the WordPress version you’re using. Please note: TemplateMonster’s latest WP themes are powered by Cherry Framework which means they’re responsive, easy-to-install and update. They also come with a number of shortcodes, custom post types and post formats. The giveaway starts today and will be running through Tuesday, September 30, 2014. Five winners will be chosen at random and notified a few days after the giveaway is over. The winners will be notified by email. So please make sure you use a valid email address when you comment on this post. Great Job designbolts and TemplateMonster, btw! J’aimerais vraiment gagner Wine wordPress #49576.
i rally want to win this kind of excellent theme. I reckon this is one of the most optimized WordPress themes I’ve ever seen. I’ll definitely recommend this to my friends as well! Great job! This is the perfect theme for any online or offline security business websites. There are loads of themes on TemplateMonster.com I’d love to WIN but this one takes the cake for me atm!